If you’re cutting out processed foods in October you are part of a growing movement of people who care deeply about what is going into their bodies. But when packages come with paragraphs of ingredients you can’t pronounce and a forest of claims you can’t verify yourself, it’s hard to feel confident that you’re making the best choice. As an organization devoted to protecting farm animals from suffering, we at the ASPCA share many of the principles that guide October Unprocessed: know where your food is coming from, read the fine print, and challenge yourself to cut out the products that don’t reflect your values. In September the ASPCA launched a national challenge asking people to make the welfare-conscious choice. 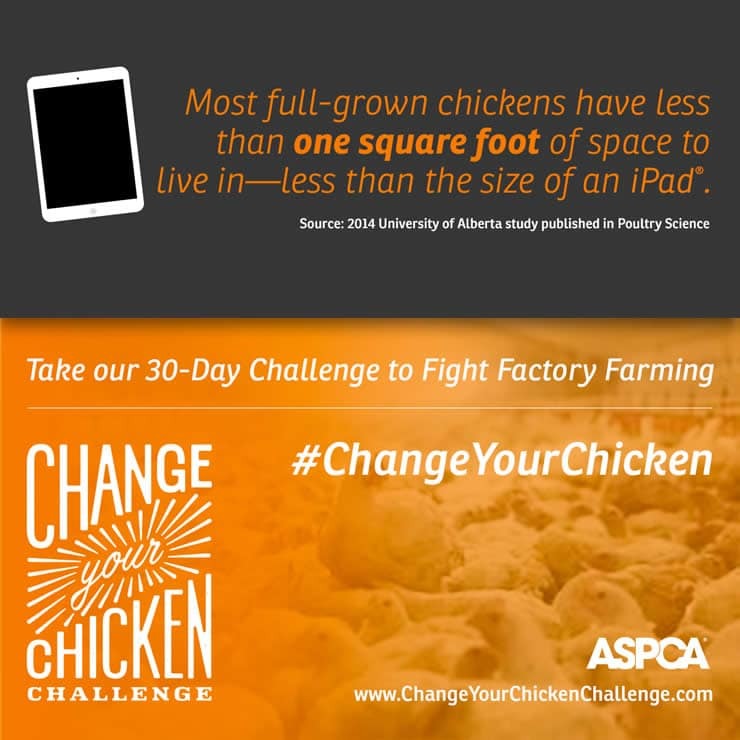 The Change Your Chicken campaign challenges consumers to avoid all factory-farmed chicken products for 30 days and instead purchase only products bearing meaningful animal welfare certifications. Using our label guide you can tell the difference between meaningless marketing and reliable assurances of how animals were raised. The website also offers tools to help you find or request more humanely raised chicken products near you. Like everything we eat, a lot has changed when it comes to how animal-based foods are produced. The red barns and rolling hills dotted with animals have been almost entirely replaced by factory farms that house animals indoors by the tens of thousands and treat them like commodities, with little regard for their welfare. In the U.S. nearly 9 billion chickens are raised for meat each year, vastly outnumbering any other farm animal. The majority of those birds live in crowded, dark, deplorable conditions on factory farms. Selectively bred for rapid weight gain, today’s chickens are so over burdened by their bodies that they spend much of their short lives lying in their own waste. These conditions aren’t only bad for the chickens — they can also have negative implications for food safety. Chickens raised on factory farms often have open wounds, which can act as a gateway for bacteria like Salmonella. Farms routinely administer low doses of antibiotics to their chickens through their feed, in order to keep them alive and growing in such unhealthy conditions, which poses a risk to human health by creating new, antibiotic-resistant bacteria. When you pledge to take the Change Your Chicken Challenge, you are pledging to cut out the worst factory farmed products, and if you purchase chicken, to buy only those certified as either Animal Welfare Approved®, Certified Humane® or Global Animal Partnership® Step 2 and above. These are third-party verified certifications with publicly available standards that prohibit the most extreme factory farming practices, and require better environments that allow animals to engage in natural behaviors. By choosing higher-welfare certified products, you are sending a loud message the chicken industry: Conventional production methods that negatively impact the welfare of chickens and human health are NOT acceptable. Once you’ve made the pledge (do it here), don’t forget to share the Change Your Chicken Challenge with your friends and family using the #ChangeYourChicken hashtag on Facebook, Twitter, and Instagram. Whether or not you buy chicken, we can all agree that animals do not deserve to suffer, and that consumers should be making informed choices. As you shop for your unprocessed meals, challenge yourself to think deeply about the lives of the animals behind the labels. Together, we can build a healthier, more humane food system. What companies have organic chicken and treat their animals humanely? It’s going to vary by region/area around the country, especially since many of the truly humane farmers are much smaller, so they may not have national distribution. Here in Los Angeles, Mary’s Chicken is a popular option (Whole Foods carries them). 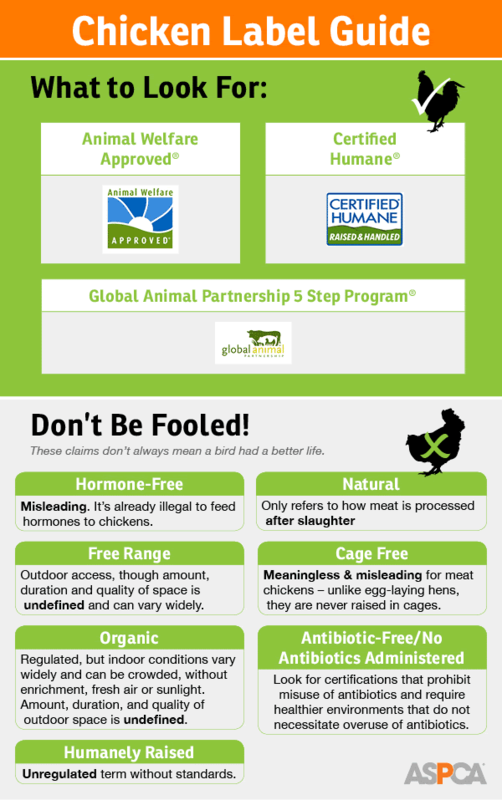 The best thing to do is look for the certifications mentioned above — Certified Humane Raised & Handled; Animal Welfare Approved; and the Global Animal Partnership “Step 2” rating or higher (4 or 5 is even better!). The GAP Step ratings are pretty much found only at Whole Foods. You can also find local farms who are humanely raising chickens, beef and pork. Visit http://www.eatwild.com to find a farm near you. Many of them have buying clubs or farm store hours where you can go, visit the farms, ask questions and buy what your family needs! I have NEVER EVER encountered these labels anywhere….we are just being fooled and getting sicker all the time- Monsanto is winning this war…. Maybe it’s just me, but somehow raising any animal, no matter how well it’s treated and cared for, just to kill and eat it – hardly seems humane in any way. Hi Eddie, for help finding these labels in a store near you, check out the Challenge Toolkit at http://www.changeyourchickenchallenge.com and scroll to the bottom section. Here you can find location-based search tools that will help you find higher welfare products – which we hope will become more available as consumer demand increases! If you have any other questions, feel free to email me at chicken@aspca.org. This is eye-opening to me. Going to be searching out these labels to help guide me.